Cannabidiol (CBD) is a naturally occurring cannabinoid component of cannabis. It is one of at least 113 cannabinoids identified in hemp plants. While delta-9-tetrahydrocannabinol (THC) is the major active ingredient, cannabidiol (CBD) can make up about 40% of cannabis extracts depending on the plant. CBD has been studied for many different uses (see below). Depending on the species the ratio of THC: CBD will vary. It is widely accepted that marijuana has two main species: Cannabis indica and Cannabis sativa (3). Generally it was considered that pure sativa has a higher ratio of THC:CBD making it more psychoactive. However crossbreeding of indica and sativa strains has led to such a wide variety of hybrid strains that making THC:CBD difficult to associate with either indica or sativa. As of 2018 in the United States, Food and Drug Administration approval of cannabidiol as a prescription drug called Epidiolex for medical uses has been limited to two rare forms of childhood epilepsy (1). CBD does not cause intoxication or euphoria (the “high”) that comes from tetrahydrocannabinol (THC). It is THC (and not CBD) that is the primary psychoactive component of marijuana. Although THC and endocannibnoids (produced in the body) activate the CB1 and CB2 receptors (G protein-coupled receptors), CBD does not directly stimulate these receptors. CBD instead displays an unexpectedly high potency as an 'antagonist' of CB1/CB2 receptor in CB1- and CB2-expressing cells, the manner with which it interacts with CB2 receptors providing a possible explanation for its ability to inhibit evoked immune cell migration. (3) Acting as an antagonist for CB1/CB2 suggests that CBD can block some of the psychoactive action of THC (4). However, because of multiple mechanism of CBD there are some circumstances where CBD may actually enhance the effects of the THC (see reference 4). CBD is being studied in a disorder called dystonia. Early research suggests that taking cannabidiol daily for 6 weeks might improve dystonia by 20% to 50% in some people. But higher quality research is needed to confirm this.-- See -Open label evaluation of cannabidiol in dystonic movement disorders. CBD being studied as an antipsychotic "... Results show the ability of CBD to counteract psychotic symptoms and cognitive impairment associated with cannabis use as well as with acute THC administration. In addition, CBD may lower the risk for developing psychosis that is related to cannabis use. These effects are possibly mediated by opposite effects of CBD and THC on brain activity patterns in key regions implicated in the pathophysiology of schizophrenia, such as the striatum, hippocampus and prefrontal cortex. 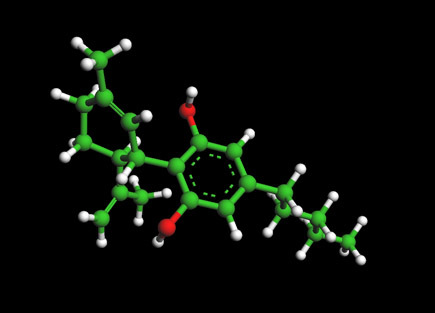 The first small-scale clinical studies with CBD treatment of patients with psychotic symptoms further confirm the potential of CBD as an effective, safe and well-tolerated antipsychotic compound, although large randomised clinical trials will be needed before this novel therapy can be introduced into clinical practice..." read more --A systematic review of the antipsychotic properties of cannabidiol in humans. See also --Cannabis extract helps reset brain function in psychosis-- Summary: "Researchers have found that a single dose of the cannabis extract cannabidiol can help reduce brain function abnormalities seen in people with psychosis. Results provide the first evidence of how cannabidiol acts in the brain to reduce psychotic symptoms." Cannabidiol normalises positive symptom-like behaviours in (Amphetamine) kAMPH-sensitised rats-- "The AMPH-sensitisation protocol leads to the induction of a permanent hyper-dopaminergic state in limbic regions and is characterised by a behavioural phenotype that is clinically relevant to the positive symptoms of schizophrenia ..."
Cannabidiol activates the mTOR signaling cascade--..." Importantly, all the prophylactic effects of CBD on schizophrenia-like behaviours in AMPH-sensitised rats were inhibited by co-administration with the mTOR inhibitor, Torin2, and the p70s6k inhibitor, PF4708671. These neuromolecular findings led to the conclusion that a potential antipsychotic mechanism of action of CBD involves activation of the mTOR signaling cascade..." Read more --A new antipsychotic mechanism of action for cannabidiol --August 8, 2016 by Anand Gururajan. Kalytera Therapuetics"The company is pioneering the use of CBD in the prevention and treatment of Graft versus Host Disease (GvHD), a disorder suffered by as much as 50 percent of bone marrow transplant patients. Clinical trials have shown CBD to be potentially efficacious in suppressing the immune-response of the graft cells while simultaneously improving the patient’s ability to fight off infections, both essential for the prevention and treatment of GvHD". Use of CBD in beer --Why CBD Infused Beer Could be the Next BIG Thing --The Long Trail Brewery in Killington, Vermont, is fast becoming one of the east coast’s biggest sellers of CBD-infused beer. Oregon’s Coalition Brewing, released its first CBD beer (named Two Flowers IPA) in November 2016. In March 2018 a Massachusetts-based brewery called Down the Road Beer Co. requested permission to add CBD to its brand-new creation, Goopmassta Session IPA. Problems with several government agencies are currently producing roadblocks.. read more about these issues. CBD Coffee- is coffee infused with CBD (cannabidiol). R. G., Pertwee1 (2008) Br J Pharmacol. The diverse CB1 and CB2 receptor pharmacology of three plant cannabinoids: Δ9-tetrahydrocannabinol, cannabidiol and Δ9-tetrahydrocannabivarin, Jan. 2008. 153(2): 199–215. Blessing E. M., et.al., Neurotherapeutics. Cannabidiol as a Potential Treatment for Anxiety Disorders 2015 Oct; 12(4): 825–836. Costa, B., et. al., Br J Pharmacol. Vanilloid TRPV1 receptor mediates the antihyperalgesic effect of the nonpsychoactive cannabinoid, cannabidiol, in a rat model of acute inflammation. 2004 Sep; 143(2): 247–250. Devinsky, O., et. al., Epilepsia. Cannabidiol: Pharmacology and potential therapeutic role in epilepsy and other neuropsychiatric disorders. Jun; 55(6): 791–802. Bih, C. I., et. al., Neurotherapeutics. Molecular Targets of Cannabidiol in Neurological Disorders. 2015 Oct; 12(4): 699–730. Ross, R., Trends in Pharmacological Sciences. The enigmatic pharmacology of GPR55. Feb. 2009. Giacoppo S., et. al., Fitoterapia. Target regulation of PI3K/Akt/mTOR pathway by cannabidiol in treatment of experimental multiple sclerosis. 2017 Jan;116:77-84. Jones NA, Hill AJ, Smith I, Bevan SA, Williams CM, Whalley BJ, Stephens GJ. Cannabidiol displays antiepileptiform and anti-seizure properties in vitro and in vivo. J Pharmacol Exp The2010;332:569–577.